Whether you are young, elderly or somewhere in between, the importance of taking care of your teeth cannot be overstated. The condition of your mouth is often an indication of your overall health and, more importantly, can impact your health and wellbeing. That’s why all smiles are important, even little smiles on little faces. Drs. Matt Mauck and Andrew Ricci put a special focus on family dentistry at their Aurora dental office, so every member of your family can enjoy a smile that is healthy and beautiful. 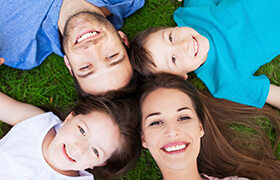 Family dentistry is a branch of general dentistry that emphasizes appropriate dental care for patients of all ages. Through regular preventive and family dental care, Drs. Mauck and Ricci can watch for common oral health conditions like gum disease and tooth decay. When these are caught and treated early, our Aurora patients can enjoy simpler treatments that are more conservative, more comfortable, less invasive and usually less expensive. Your family dentist in Aurora would much rather find decay early and treat with a simple tooth-colored filling instead of finding a much larger cavity later that requires a dental crown. One way we protect the smiles of Aurora’s youngest citizens is with helpful services such as dental sealants and fluoride supplements. Family dentists use both of these to prevent decay and erase the need for fillings. 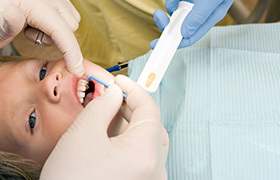 Dental sealants go on as a plastic liquid that is applied directly to teeth—typically the premolars and molars at the back of the mouth—and is hardened with a curing light that results in a thin layer of plastic. Once applied, they can provide years of effective protection. Fluoride supplements, meanwhile, support and strengthen teeth by attracting important nutrients and minerals to teeth. Moreover, fluoride has been shown to remineralize teeth where a small amount of decay has begun. With fluoride, your tooth may actually be able to repair itself. Despite a wider focus on patients of all ages, the goals of family dentistry in Aurora are the same as goals for general dentistry. We want to create healthy, beautiful smiles—period. And with years of experience and a variety of contemporary services and advanced dental technology, we’re doing exactly that. If you’re new to Aurora or if you’re looking for a new dentist, let D’Amico & Mauck, DDS show you how we can help your family. With our focus on families, plus our effective restorative and periodontal care, and our friendly, caring team, we can help patients of all ages leave our Aurora dental office with improved oral health and confidence. And remember to schedule a checkup and cleaning with us twice a year. These regularly scheduled visits help us provide family dental care that keeps all smiles clean and helps young smiles develop as they should.